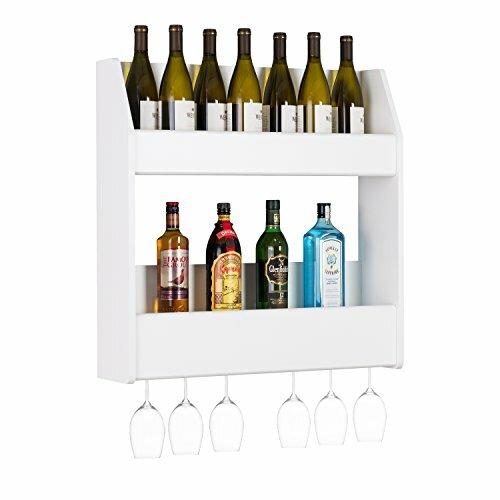 Proudly display your wine or liquor collection with this two tier floating wine and liquor rack. The unique wall mounted system has a compact design to Conserve space in your bar, living room, kitchen, or dining area. Slide your stemmed wine glasses into the hidden channel underneath to store both bottles and glasses in one convenient location. Solid construction and available in a variety of finishes to complement any existing decor. Mount individually or as a pair to increase your storage space. This product ships "ready to assemble" with an instruction booklet for easy assembly and installation. Includes a 5-year manufacturer's limited parts warranty. Manufactured in Canada and meets all North American safety standards. View More In Wall-Mounted Wine Racks. If you have any questions about this product by Prepac, contact us by completing and submitting the form below. If you are looking for a specif part number, please include it with your message.